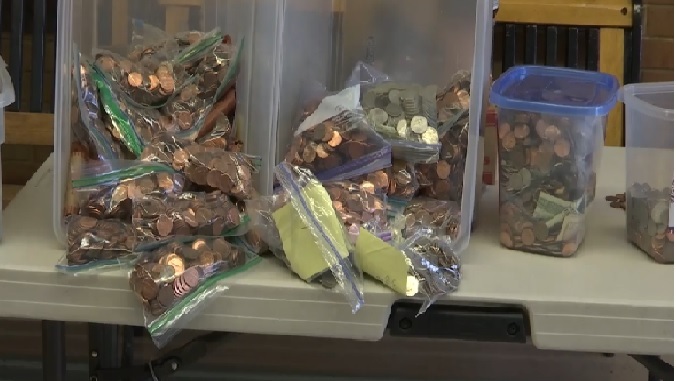 ST. GEORGE — Students at East Elementary in St. George waged “Penny Wars” all last week and raised more than $2,150 for the benefit of needy children throughout Washington County to be distributed through KONY’s Coins for Kids. For five consecutive days beginning Nov. 30, the students at East Elementary in St. George began their days waging wars — penny wars, that is. These fundraising titans collected just over $2,150, with almost $1,000 coming in Friday morning alone, PTA President Steve Burgess said. 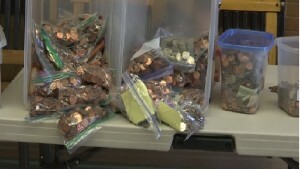 “Penny Wars” is a fundraising game where two teams compete against each other to get as many points as possible during the “war.” Each penny is worth a point, Burgess said, but all other denominations of coins and bills put in a competitor’s bin count as points against the pennies, creating lots of action between the teams. The money raised during the penny war is donated to a local charity. At the end of the competition, the money the students raised was donated to Kony Coins for Kids, a nonprofit charity that has provided Christmas toys and clothing for needy children in Washington County for more than 25 years. St. George News media reporter Sheldon Demke contributed to this report.